Take a look at these cards that were created by Richard Glasgow who served in Tokyo as an airman first class in the Air Force from 1963-1967. His goal is to have each of the estimated 3 million service men and women and 24 million veterans across the country get one of these business cards that he has created to show his appreciation for their service. To order these FREE cards to hand out to military members and/or their families, click here. 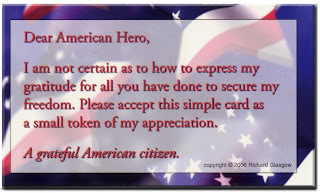 The "Dear American Hero" card pictured above is designed to be easily carried during your daily life so that when you come upon one of America's Heroes you have an effective heartfelt way to say "Thank You." The new "Family Thank You" card pictured above provides a way for you to recognize the Sacrifices that the Families make everyday for your American way of life.